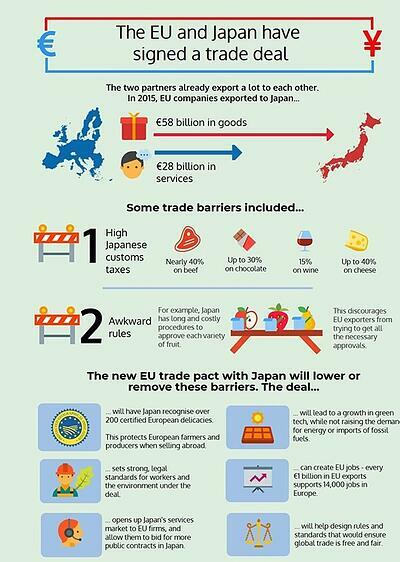 The EU and Japan have arrived at an Economic Partnership Agreement (EPA) that is set to enter into force February 1, 2019. For the EU, the free trade agreement is expected to generate considerable gains in sectors such as agriculture, beverage, textile, apparel, and leather products—sectors that contain a significant number of small- and medium-sized enterprises. For Japan, the main gains will be collected by manufacturing, especially in the motor vehicle sector, follwed by expected increases in the export of minerals and glass, machinery and equipment (including medical, precision, and optical instruments), and chemicals. In 2017, about 60 percent (€36 billion) of EU exports to Japan consisted of chemical products, transportation equipment, and machinery, while agricultural products and processed food represented more than 10 percent. Once this EPA enters into force, EU exporters of agricultural products will no longer be subject to Japanese tariffs on products such as beef and cheese, which previously carried up to a 40% tariff. EU importers will also enjoy reduced import duty. In 2017, the vast majority of imports from Japan were in machinery, including electronic appliances and transportation equipment. These sectors are expected to benefit the most from the free trade agreement. While the EU has almost fully liberalised its tariff lines and imports, Japan’s were liberalised to a lesser extent. However, Japan has provided significant tariff reductions and concessions in tariff rate quotas, as well as addressed important non-tariff measures as part of this EPA, for example the protection of EU intellectual property rights in Japanese markets. In order to obtain the benefits established by the free trade agreement, the EPA includes key provisions similar to those contained in other EU trade agreements for the preferential rules of origin, e.g., the principle of territoriality, provision on insufficient operations, accounting segregation, and non-alteration rule. The agreement also provides economic operators interesting opportunities for both bilateral and full cumulation between Japan and the EU. This peculiarity is even more impactful since the duty drawback is not prohibited by the free trade agreement. In addition, the claim for preferential tariff treatment can now be based not only on a statement of origin by the exporter/producer, but also on the importer’s knowledge. This new feature allows EU importers to claim preferential tariff treatment based on supporting documents they have received from the product exporter or manufacturer. Moreover, for automobile manufacturers, the facilitation of the burden of proof mechanism is intended to help them demonstrate the origin with an alternative processing rule, however it does not imply a relaxation of the product-specific rules of the components. Concerning the product-specific rules of origin, a 50% maximum threshold for non-originating materials (NOM) based on the Ex Works (EXW) calculation method has been agreed upon. An alternative method of calculation based on Regional Value Content (RVC) may also be used, with a differential of 5% that ensures no further relaxation is allowed through this method. For some products, the threshold for NOM or RVC will progress over time. For instance, for passenger cars the maximum threshold for NOM is 55% for the first three years, dropping to 50% over the next three years, and ultimately decreasing to 45%. EU exporters and importers making use of the importer’s knowledge will have to monitor the changes in thresholds. Follow us on LinkedIn, Twitter, and Facebook, or bookmark the C4T Inspire blog to keep tabs on customs and trade updates.